EXCLUSIVE: 3View's Freeview HD/internet 500GB PVR on sale in March for £299 | What Hi-Fi? It's from a relatively new British start-up company, 3View, and is due to go on sale in March for £299. It will initially be sold online, but 3View hopes to strike deals with the likes of Tesco and Best Buy too. But what's clever about this particular set-top box is that it's far more than just a Freeview HD receiver. It has a built-in 500GB hard drive for recording, has wired (via Ethernet) or wireless (via USB dongle) internet access, comes loaded with apps for YouTube, Facebook and Twitter and has twin Freeview HD tuners. The white version shown here is a prototype, but we hope to get our hands on a finished production model in the next few weeks. "This is really a home network device," explains 3View managing director John Donovan. "It connects to the web, and you can use the PVR as a media storage device for video, photos, music and so on. We wanted to develop a set-top box that blends the internet and free-to-air HD TV." 3View uses Linux operating software, a Sigma 8654 chipset, dual Sony Freeview HD DVB-T2 tuners and a specially developed circuit board. There's a bespoke eight-day EPG which allows you to do the usual pause/rewind live TV, record episode/series stuff, and the company has added some nice touches to make recording and managing the content on the hard drive simpler. For instance, the search function has predictive text so it's easier to track down particular programmes you've recorded, you can set it to record programmes automatically in HD or SD, and select high, medium or low bitrate recording for internet TV channels. And you know how annoying it is when your hard drive fills up and it stops working? Well 3View has a solution for that too: you can choose how long you want to keep recordings: forever, a number of weeks or just a few days. Nifty. For web access, the Opera 10 browser is built in and there are widgets for Facebook and Twitter, plus a simple link to YouTube. 3View hopes to add the BBC iPlayer in due course, and there are even plans to link up with the Gracenote database. 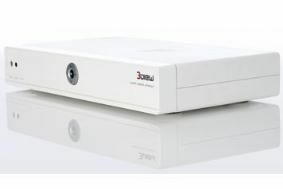 Connectivity includes HDMI, Scart, Ethernet, USB 2.0 and a digital coaxial output, and the box is DLNA and UPnP compliant. There's full support for 1080p/24 and 1080p/60 HD content, it will play MPEG 1, 2 and 4 H264 video files, handles Windows Media and even has Z-Wave compatibility for home automation control. The spec is impressive, but Donovan admits the prototype still needs a bit more tweaking. "We need to tune the picture quality on the Sony HD tuners to make sure it's the best we can get, and make sure the box will get good reception from a wide range of rooftop aerials." Production is due to start next month. As soon as we get a fully working sample, we'll let you know how we get on.